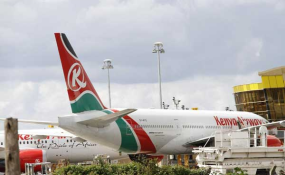 Airlines operating from the Jomo Kenyatta International Airport (JKIA) in Nairobi were Thursday forced to divert to regional airports for fuelling as stocks of the commodity neared depletion. The fuel shortage, which is expected to persist till Sunday, has been blamed on inadequate orders by oil marketing companies that sell directly to airlines. In an interview Thursday, Kenya Civil Aviation Authority director-general Gilbert Kibe said a fresh delivery had arrived in Mombasa and was to be pumped to Nairobi, with normal supply expected to resume by March 10. "We have issued notice to airlines and they are aware of the current shortage that we are facing," said Mr Kibe. Egypt Air Flight MS850 enroute to Cairo made a technical stop-over at Entebbe International Airport in Uganda for refuelling. According to the flight tracker, the aeroplane left Nairobi at 4:20am (0120 GMT) Thursday and was meant to be in Cairo by 8am (0500GMT), but it delayed by three hours due to the detour to Entebbe. Nairobi-based cargo airline Astral Aviation had to fuel its aircraft in Juba, Mogadishu and Djibouti; with some that were coming from Europe expected to fuel at Kilimanjaro International Airport in Tanzania. "The current shortage of jet fuel at JKIA has seen our aircraft fuelling at the regional airports," said Astral Aviation commercial manager Mustwafa Murad. The shortage, he said, has subjected airlines to expensive jet fuel in other airports where they were forced to pay more for the commodity. Jet fuel in Entebbe is, for instance, $12 cents higher than in Nairobi, Mogadishu $38 cents costlier, Kilimanjaro $14 cents more expensive and Juba $30 cents more. Kenya Airways chairman Michael Joseph said the national carrier had not yet felt the shortage. "I probably think that we will still have enough supplies up to Sunday when normal supplies will resume at the airport," he said. The available stocks at JKIA were expected to be depleted Thursday, but the situation was salvaged by an industrial action at the airport that disrupted flights, hence suppressing demand. Operations at most airports were paralysed on Wednesday by a strike called by the Kenya Aviation Workers Union (Kawu), which led to the cancellation of some flights. Near-normal operations resumed at the airports Thursday, accelerating fuel consumption. Kenya Pipeline Company (KPC), the agency charged with transportation and storage of jet fuel imported by oil marketers, had warned that there were only 10 million litres in storage, against daily consumption of 2.5 million litres. A vessel carrying 115 million litres of jet fuel docked at the Port of Mombasa on Tuesday and started discharging the commodity at 5pm (1400 GMT). According to KPC officials, the volume discharged has already been introduced into the line and is being pumped to Nairobi. "Post receipt, recertification and transfer to appropriate hydrant-bound tanks puts product availability for loading at Sunday March 10 from 10:00 hours (0700 GMT)," reads a communication from Aviation Service Management. The shortage has hit JKIA and Moi International Airport in Mombasa hardest. In January, the sector was alarmed when marketers placed an order for 37,000 tonnes of jet fuel against a request for 60,000 tonnes.